Can Measles Vaccine Cause Injury & Death? polyneuritis (inflammation of several nerves simultaneously). In November 2014, the National Vaccine Information Center published a special report The Emerging Risks of Live Virus and Virus Vectored Vaccines: Vaccine Strain Virus Infection, Shedding and Transmission. 7 This report reviewed the medical literature for evidence that live virus vaccine strain infection, shedding and potential for transmission occurs, including measles vaccine strain infection and shedding. 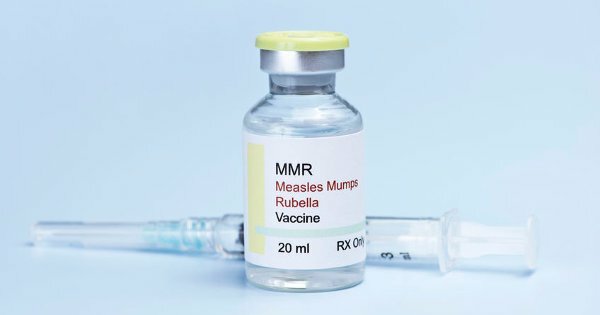 As of November 30, 2018, there have been more than 92,844 reports of measles vaccine reactions, hospitalizations, injuries and deaths following measles vaccinations made to the federal Vaccine Adverse Events Reporting System (VAERS), including 457 related deaths, 6,902 hospitalizations, and 1,736 related disabilities. Over 50% of those adverse events occurred in children three years old and under. As of January 2, 2019, there had been 1,258 claims filed in the federal Vaccine Injury Compensation Program (VICP) for injuries and deaths following MMR vaccination, including 82 deaths and 1,176 serious injuries. One example of an MMR vaccine injury claim awarded compensation in the VICP is the case of Madyson Williams. Madyson was growing and developing normally until May 12, 2006, when she was given MMR, varicella zoster and Hib vaccines simultaneously during an office visit. Six days later, she developed seizures and died. During the course of their investigation, Wakefield and his colleagues learned that Hans Asperger had observed a high rate of gastrointestinal (celiac) disease in children diagnosed with autism. After studying children suffering with inflammatory bowel disease being treated at Royal Free Hospital, they hypothesized that persistent viral infection, either from natural measles disease or live virus measles vaccine, could cause chronic inflammation in the bowel and damage to the central nervous system in some children. However, they emphasized in their paper that they had not proven a cause and effect relationship between autism, MMR vaccine and non-specific colitis, which they described as “autistic ileal-lymphoid-nodular hyperplasia,” and called for more studies to explore the potential relationship. Today, the majority of doctors and health officials reject the suggestion that MMR vaccine is associated with the development of autism in children. However, privately funded research continues to investigate the potential association between vaccines, including MMR vaccine, and the development of autism, inflammatory bowel disease and other kinds of brain and immune system dysfunction in previously healthy children. For additional research on the health risks of the MMR vaccine, visit the GreenMedInfo.com database on the subject. 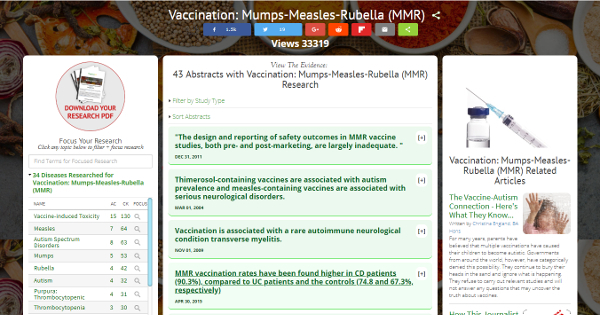 6 Merck & Co., Inc. MMRII (Measles, Mumps, Rubella Virus Vaccine Live). 2014. 7 Fisher BL. The Emerging Risks of Live Virus and Virus Vectored Vaccines: Vaccine Strain Virus Infection, Shedding and Transmission. NVIC November 2014. 8 Jenkins GA, Chibo D, Kelly HA et al. What is the cause of a rash after measles-mumps-rubella vaccination? Med J Aust 1999; 171(4): 194-195. 9 Berggren KL, Tharp M, Boyer KM. Vaccine-associated “wild-type” measles. Pediatr Dermatol 2005; 22(2): 130-132. 10 Morfin F, Beguin A, Lina B, Thourenot D. Detection of measles vaccine in the throat of a vaccinated child. Vaccine 2002; 20(11-12); 1541-1543. 11 Kaic B, Gjenero-Margan I, Aleraj B. Spotlight on Measles 2010: Excretion of Vaccine Strain Measles Virus in Urine and Pharyngeal Secretions of a Child with Vaccine Associated Febrile Rash Illness, Croatia, March 2010. Eurosurveillance 2010 15(35). 12 Nestibo L, Lee BE, Fonesca K et al. Differentiating the wild from the attenuated during a measles outbreak. Paediatr Child Health Apr. 2012; 17(4). 16 Rosenthanl S, Chen R. The reporting sensitivities of two passive surveillance systems for vaccine adverse events. Am J Public Health 1995; 85: pp. 1706-9. 17 U.S. Department of Health and Human Services. Statistics Reports. Claims Filed and Compensated or Dismissed by Vaccine – March 1, 2016. National Vaccine Injury Compensation Program. March 1, 2016. 22 Weibel RE, Casserta V, Benor DE, Evans G. Acute Encephalopathy Followed by Permanent Brain Injury or Death Associated with Further Attenuated Measles Vaccine: A Review of Claims Submitted to the National Vaccine Injury Compensation Program. Pediatrics 1998; 101(3): 383-387. 23 Alderslade R, Bellman MH, Rawson NSB, Ross EM, Miller DL. The National Childhood Encephalopathy Study: A Report on 1000 Cases of Serious Neurological Disorders in Infants and Young Children from the NCES Research Team. Her Majesty’s Stationery Office 1981. 24 Ward KN, Bryan NJ et al. Risk of Serious Neurologic Disease After Immunization of Young Children in Britain and Ireland. Pediatrics 2007; 120(2): 314-321. 32 NVIC. Research Into Vaccines, Autism and Intestinal Disorders Published in The Lancet. Press Release: March 3, 1998. 34 Institute of Medicine Immunization Safety Review Committee. Immunization Safety Review: Vaccines and Autism. National Academies Press 2004.